Green Islands : Regan Gentry. 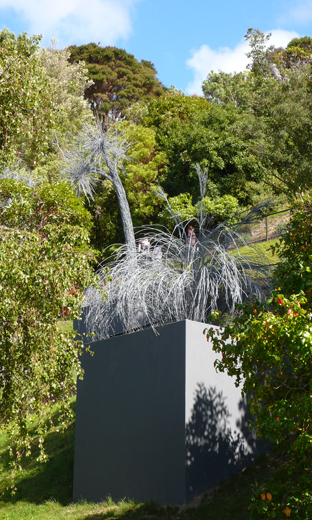 Six plant species constructed from No.8 fence wire and stainless steel staples. 8m x 20m x 3m. Wellington Botanic Gardens. 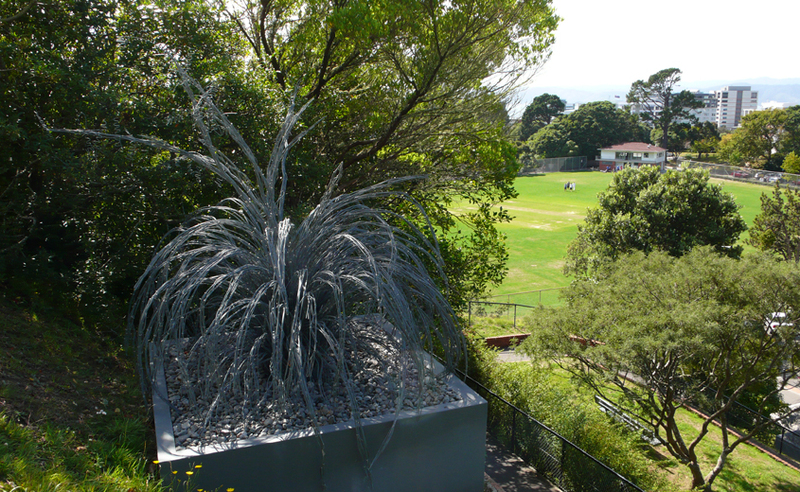 Commissioned for initial two-year display Four Plinths Project, Wellington waterfront, then relocated to Wellington Botanic Gardens for permanent display in 2010. Essay 1 - from catalogue. Four unprepossessing bollards in the Te Papa forecourt have for some years gone unnoticed by the thousands of pedestrians that pass by them daily. Joggers weave between them, the scouring salt-laden winds pass through at speeds of up to 100km/hr, with gusts averaging 60km/hr on 173 days of the year. Remorseless sun bakes the tiled bluestone surfaces of their solid bulk. Occasionally someone scrawls in chalk on their sides, a message lasting perhaps only a couple of days in that harsh weather-beaten environment. Grey and stolid, they fit unremarkably into the grey theatre-like space, somewhat dwarfed by the massiveness of the Te Papa architecture. Yet in this urban wasteland, something has grown. The Four Plinths Sculpture Project has had a lengthy gestation period. The 2008 launch of the project, with Regan Gentry’s Green Islands, represents the culmination of nearly three year’s work, since the project’s 2004 inception as an annual sculpture award designed to foster a local creative community, enliven the waterfront, and consolidate Wellington’s reputation as an arts capital. The initiative has developed laterally, and undergone considerable evolution, yet it retains its focus on those same objectives. Fittingly, Green Islands not only references an organic model, but its launch coincides with start of summer, and it is the first in an ongoing project. On the part of the Wellington Sculpture Trust members, the development process took the form of hours of meetings, where debate ranged from what constituted ‘temporary’, to how to ensure the work’s survival in documentary form, to how an ‘award’ differed from a ‘fee’. For the dedicated panel of selectors, there was the unenviable job of narrowing a field of excellent proposals down to one. And for the artist, in addition to working over the recent weeks to a schedule that would have most of us going on strike, it has required the patience to accommodate months of bureaucratic processes alongside the usual technical challenges and demands of construction. Perhaps the Four Plinths Sculpture Project is best summed up in a sentiment often expressed among the Trustees: the path of true sculpture never ran smooth. 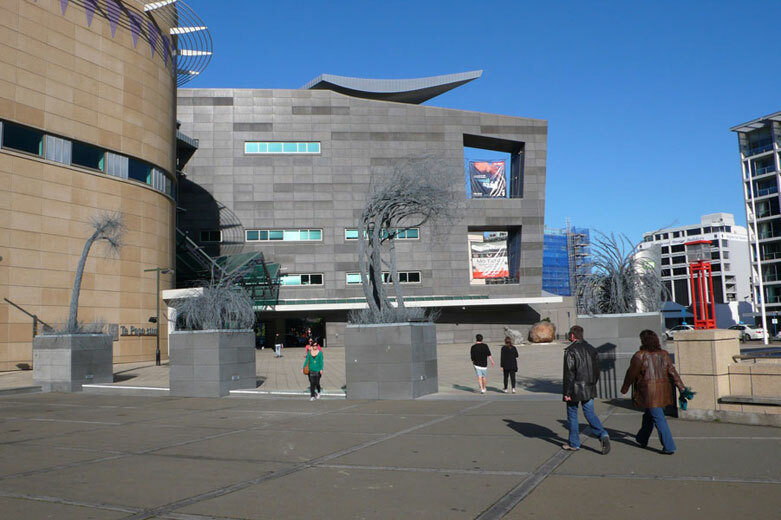 In 2004 Trust Chairman Neil Plimmer presented a paper to the October meeting of the Trust’s board, suggesting the four cubes in Te Papa forecourt be considered as a site for a recurring temporary sculpture project. 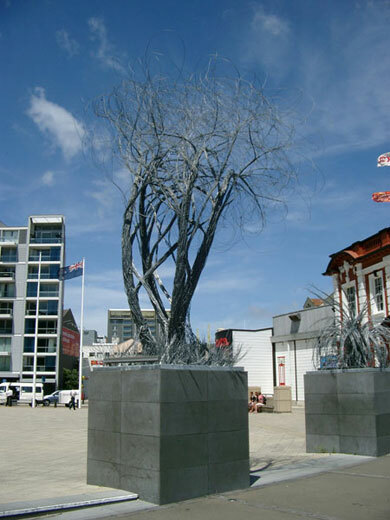 This had grown from his belief that Wellington City Council and the Trust needed to put more resources into addressing what he saw as a conspicuous gap in the visual arts in Wellington, and more particularly, in a core of ‘top-flight’ sculptors in the region. 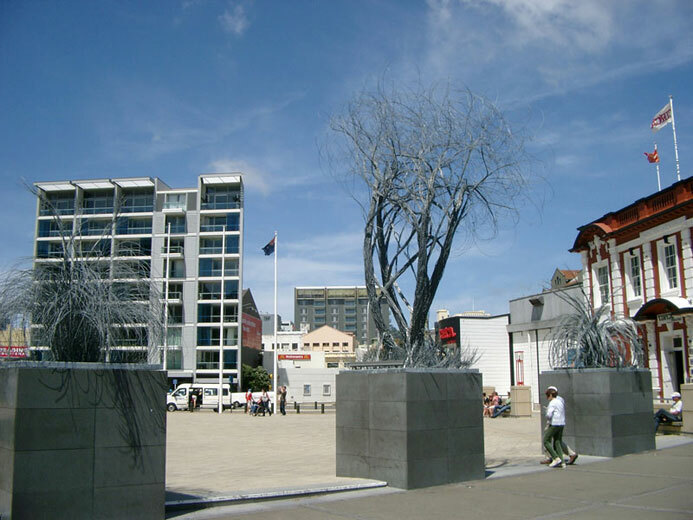 It would also respond to the Wellington City Council’s new Public Arts Policy, which placed emphasis on sculpture events and temporary sculpture in the city. Calling the cube-shaped bollards in Te Papa forecourt ‘plinths’ reinforced their status as supports for art, and drew a nice parallel with the Fourth Plinth sculpture project in Trafalgar Square, London. The Trust endorsed the project, and a new trustee, Jenny Harper, offered to take the role of project manager. A subsequent discussion paper was presented to the Mayor and the Council, where it received full support. Early in 2005 Neil met with Sally Morgan and others at Massey University, Seddon Bennington, CEO of Te Papa, and with Ian Pike of Wellington Waterfront Ltd which, it transpired, owned the four plinths, and received their enthusiastic support. A letter to the WWL Chairperson Fran Wilde and conversations with staff lead to confirmation that the four plinths could be made available for the project, and a commitment of $20,000 funding support for it. At this point curator Lara Strongman was contracted to develop a brief for the project, which she completed with Jenny Harper’s assistance in late 2005. The comprehensive report considered a range of options for selection processes, prizes, and documentation. A loose budget was drawn up, allocating the artist’s fee, a sum for documentation of the work, and for the costs of establishing this ongoing event. This enabled a funding application to the newly formed WCC Public Arts Panel, and to Creative New Zealand (which was declined). An initial amount of $15,000 was secured from the PAP, and later, in 2007, a second grant of the same amount. Late in 2006, on Jenny’s leaving the Trust to take up a position as Director of the Christchurch Art Gallery, Katy Campbell took over responsibility for the project. The project file was by this time substantial, and was to grow rapidly over subsequent months. 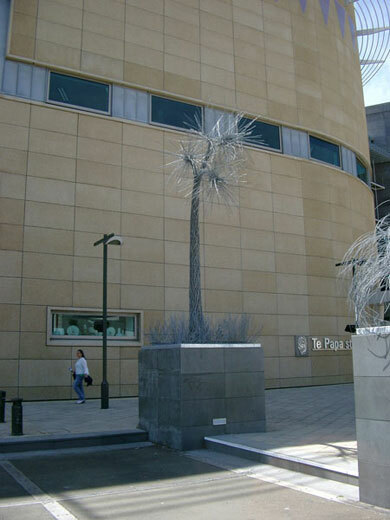 It was decided by the board to expand the selection pool of sculptors to national, separating the Four Plinths Sculpture Project from a regional and emerging artists focussed event, and increase the artist’s payment to $20,000. 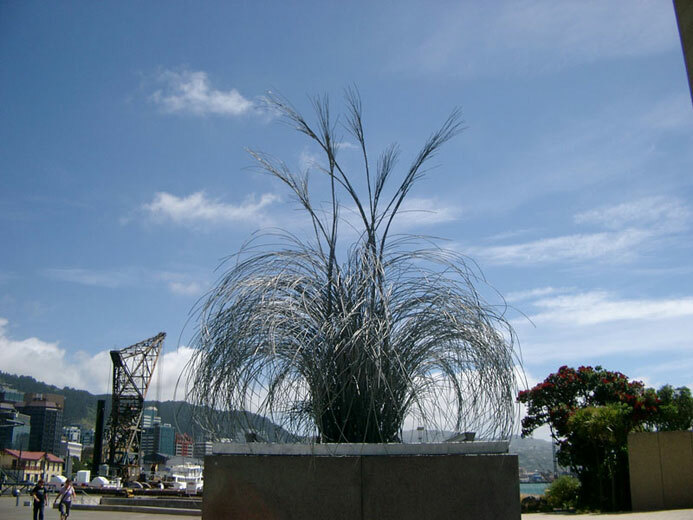 As it was initially conceived, the project would operate as an ongoing event, with the aim of building national and international awareness over time, and functioning as a showcase of New Zealand’s pre-eminent sculptors. A selection panel was formed, comprising Katy Campbell (Chair), Sue Elliott, Christina Barton, Elizabeth Caldwell, Chris McDonald, Richard Reddaway and Neil Plimmer. The group first met in February this year. The first task of the panel was to define the nature of the ‘competition’. The majority supported a focus on ‘project’, rather than emphasising the competititve aspect through the awarding of a prize. It was also necessary to define the conditions of ‘temporary’— how long would the mininmum duration of the installation be? The conditions of the site demanded a robust work; the original concept was built on what was seen as its point of difference from other Trust commissions — it was to be temporary, potentially ephemeral, and respond sensitively to the site in ways which a permanent public work would perhaps be more restricted. The selection process as a whole initiated rigorous debate, which continued across a series of meetings throughout early 2007. Eventually consensus was reached around approaching thirteen artists across a national field, and requesting from them an ‘expression of interest’ in creating a work that would last for a minimum of six months on the site. The request for an expression of interest was seen as crucial to the panel, as they were acutely concerned not to ask for a fully developed proposal from a large pool of artists, only to have to refuse all but one. The project would take place on a biennial rotation basis, and be timed to coincide with the International Festival of the Arts. A sum of $20,000 was to be awarded to the selected artist, the work to remain in their keeping upon de-installation, and the Trustees to work in close collabration with the artist toward the completion and documentation of the work. Thirteen artists from around the country were duly selected and approached. The panel had worked to devise a list of artists they felt had both the capacity to respond well to the site, and the ability to work within the structure of the project in innovative ways. Katy took the time to visit as many of the approached artists as possible, talking to them about the site and its possibilities, and responding to questions about the brief. The eleven expressions of interest that came in reflected an unanticpated depth of engagement with the brief, and made the selection panel’s task of narrowing them down to one highly challenging. On the positive side of this was an increased awareness of the potential for future projects, and for the Trust, the forging of new relationships with several practicioners previously unknown to them. Regan Gentry’s Green Islands, the work eventually chosen, is written about in greater depth in Amy Howden-Chapman’s accompanying text. Suffice to say here that while all the submitted proposals were impressive, Regan’s caught the imagination of the panel from the outset. It responds fearlessly to the space, avoiding both the flippancy and the self-consciousness that such an imposing site can sometimes bring out in temporary works. Very early in the process, one of the panel members commented that this would be the type of work Wellingtonians would miss when it was removed at the end of its two year installation period. Time will confirm this; certainly it is a work that has engaged immediately and genuinely with all those who have been fortunate enough to see it develop. Its robustness belied by the seeming delicacy of the skeletal wire forms, Green Islands holds its own in an inhospitable urban environment. And it does more than that. I began this piece with a quote from T.S Eliot’s The Waste Land. To say that what Green Islands does is akin to ‘[B]reeding, /Lilacs out of the dead land’ (as the poem goes on to say) is perhaps crudely overstating the point, but it is the unforeseen blooming in a grey urban ‘wasteland’ that constitutes the startling potential of this public sculpture. Ghostly grey itself, the sculpture does not decorate the space, rather it bravely occupies it, and ‘grows’ where nothing has before. ‘The roots that clutch’ are number 8 wire, the sound of crickets perhaps furnished only by our own imaginations, but it is Green Island’s capacity to invoke this collective imagining which makes it the only truly living element in its man-made setting. Following this inaugural work, the Four Plinths Sculpture Project will continue on a two yearly basis, the next scheduled for 2009. The Sculpture Trust envisages it becoming an event of international scope, and hopes over time to increase funding support to make this possible. While the project will maintain its focus on temporary, and site specific works, a separate project will be developed to target emerging and local artists, in line with the Trust’s ongoing commitment to foster a strong and self-sufficient community of young local sculptors in the capital. Essay 2 - from catalogue. On the Wellington waterfront, between Te Papa Tongarewa and Circa Theatre, flanked by the harbour on one side, and the city on the other, stand four stone-tiled cubes. These austere structures mark the edge of a plaza that is dominated by architecture. This is a place to pass through. There is no grass to picnic on. The wind rushes through as tourists flood out of buses and cross the grey expanse into the museum. It is into this inhospitable environment that Wellington sculptor Regan Gentry has ‘planted’ his new work, Green Islands. Green Islands continues Gentry’s investigation into ideas of taming the wilderness and the contest between indigenous and exotic. 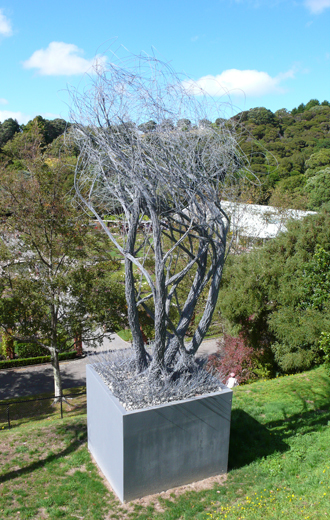 The direct antecedent of the work is Skeleton Trees, commissioned for Connells Bay Centre for Sculpture on Waiheke Island in 2006. Like Green Islands, the Skeleton Trees were constructed out of No.8 wire, bent and woven into forms roughly based on Kanuka trees. The notion that the ultimate manifestation of Kiwi ingenuity is the ability to make anything out of No.8 wire coincides nicely with Gentry’s practice to date. He excels in making the most out of recycled materials, often in a witty way. Apart from its obvious botanical interpretation, this work’s title, Green Islands, also refers to the Dunedin suburb home to the tip and dump shop – a hunting ground for materials that Gentry made good use of in his years at Otago Polytechnic art school. The cultural connotations that hang heavy around No.8 wire belong to a bygone era, a time before emphasis (or at least rhetoric) shifted from promoting New Zealand as an agricultural economy to a ‘knowledge economy’. Coinciding with the hype of the knowledge economy, came the increasing economic importance of boutique industries such as wine making, and a greater emphasis on marketing New Zealand as a tourist destination. Wellington’s waterfront is an obvious example of New Zealand’s changing perception of itself – from port to tourist attraction. Branding New Zealand as 100% Pure awakened a resurgence of pride in the distinctiveness of the natural environment, and awareness that culture, be it Lord of the Rings, or more subtle and home-grown projects, also have a role in advertising New Zealand to overseas audiences. New Zealand’s promotion of these twins, Nature and Culture, provides an opportunity to introduce more critical dialogues that question the manner in which the environment is being used. 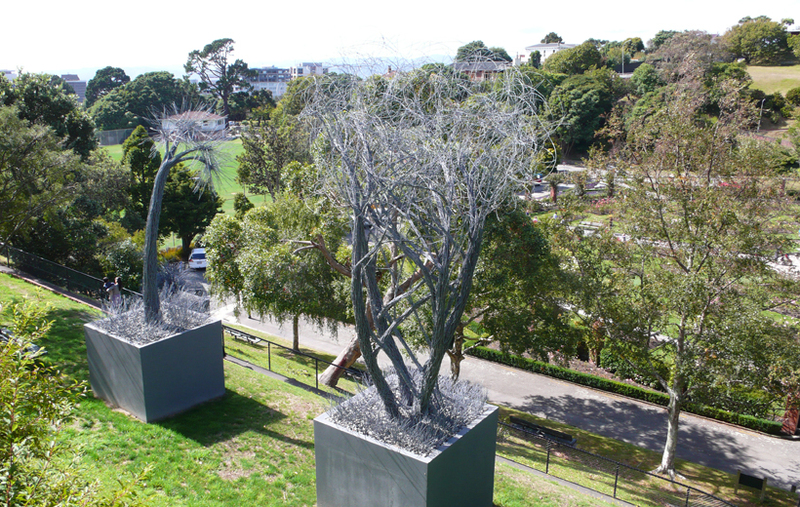 On Waiheke, Skeleton Trees are seen in the context of their natural counterparts. Meandering along a dirt track, the twisting brown trunks and dark wind-battered canopies of real Kanuka trees suddenly give way to a monochrome blaze of twisted wire. Green Islands takes this same image, and a similar technique, and drops them into an urban setting. By depicting a selection of plant species as isolated elements in an urban space, Green Islands questions the way we transform nature into a cultural product. Researching urban plantings for another sculpture project titled Subject to Change, led Gentry to undertake a survey of plantings around Wellington city. What came to his attention was the pragmatic logic of these urban plantings. Plants on traffic islands, for example, are guarded by constantly passing cars, which prevent people or animals getting anywhere near them. These trees fulfil a purely decorative role, a fragment of green in the middle of the tarseal strip. Rules of urban design dictate the lay of the land in our metro-wilderness; the antithesis of a natural forest system, where intricate ecosystems are at work and levels of canopy, undergrowth, fungi and epiphytes are all interconnected and coexisting. Gentry’s earlier project Of Gorse of Course examines the complexity of a regenerating ecosystem. While collecting pieces of ‘old man’ gorse wood to produce a small army of products ranging from gorse toilet paper to carved replicas of deer antlers and fish and chips, Gentry took note of the process of succession in the regenerating bush around him. ‘You strip the ground, then bracken will turn up – then Kanuka will turn up, then the forest will start growing through that.’ Even much-maligned gorse plays its role in this process as a useful nursery plant, sheltering native seedlings. Within urban ecosystems, plants are vital to maintaining public health and comfort. A scarcity of trees in urban environments exacerbates problems with water runoff and can contribute to urban heat waves. A city that is dominated by concrete and asphalt retains the day’s heat, and high temperatures are sustained through the night. The leaves of city trees catch rain, lessening the flow of runoff, and the soil below them absorbs water, diverting rain from the stormwater system. A city with more trees floods less often, and requires fewer infrastructures. The species presented in Green Islands have been chosen to represent some of the most common species planted by the Council around Wellington. The species are not without controversy – a debate rages in the Dominion Post every time pohutukawa trees are planted, because their natural range stops well north of the Rimutaka Ranges. According to the experts, this plant should be replaced with Northern Rata, a relative indigenous to this part of the country. Agapanthus, a South African plant like many exotics that thrive in New Zealand, is a widely-used plant that has recently been termed a weed. Other plants are chosen for their hardiness – there is a gentle humour in the Council selecting mountain tussock to plant along Wellington’s windswept roads and public parks. Gentry’s choice to depict introduced as well as native plants, mimics the manner in which exotic plants, are now intertwined, in gardens, bush and urban environments, with native species. The plants in Green Islands do not aim to be scientific representations - they are sketches, pictures from memory. Rather than taking photos and trying to create perfectly the structure of the trees, Gentry prefers to study a species, learning its growth patterns and characteristics. His trees derive their form from a synthesis of these memories in conjunction with what the wire material will allow. Gentry talks about the wire as a line. He describes Green Islands as a drawing in three dimensions – the way the tree is fabricated is analogous to putting all the pencil lines on the paper first, and then shaping the lines into the desired form. The trees’ production is a kind of performance: the material already exists, the wire is all laid out, but the form of each tree slowly grows over time, fed by a thousand tiny droplets of human clipping action. To produce the trees Gentry used what he described as a technique of ‘cross-directional weaving’ – the wire is bunched and fastened together with small clips to create the form of the plant. No.8 wire is not a kind material, and the sculptures are a far cry from a silky, stroke-able hunk of marble. ‘It’s horribly sharp – I’ve got lots of holes in me from it’, Gentry complains about working with the wire. The trees took Gentry along with an assistant over two and a half months to construct. In total they use over 20 km of wire that is held in place by over 20,000 small wire clips. The tallest of the four plants, the pohutukawa, is over 6.5 meters tall and weighs 1.4 ton. The wire renditions of trees and plants that make up Green Islands are not green, they have no roots, they don’t photosynthesise, and they drop no leaves. They stand on plinths, structures designed to elevate and separate sculptures from their immediate context. These structures share little with their living counterparts – they blend into the steel-grey of the concrete surroundings, but pared back without the colour or texture of real trees we become aware of the underlying form. These objects provide none of the function of real trees; they are useful habitat to no birds, collect no rainwater and provide no shade - but in their deficiencies they succeed in reminding us of the many vital functions of plants in our environment. As the planet becomes increasingly urbanised, the way in which plants are integrated into cities will be of key importance to maintaining biodiversity, atmospheric stability and water management – not to mention creating beautiful places to live in. The importance of having urban spaces that are scribbled and riddled with green, rather than containing only isolated islands of decorative and unintegrated planting, is what Gentry’s Green Islands reminds us, while they impress with their woven spiky splendour. Regan Gentry’s plants don’t have roots; nor do they seem to notice Wellington’s famous Southerlies. That’s because they are made from wire – number eight fencing wire, to be exact! Regan is a sculptor. 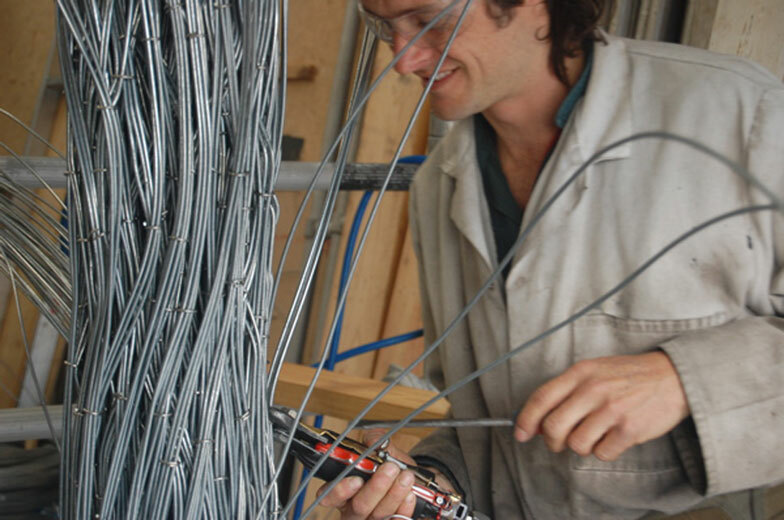 His latest project uses twenty kilometers of wire and 25,000 stainless steel clips to create four native plants: a tussock, flax, p?hutakawa, and cabbage tree. These beautiful specimens will be spending the next two years down on the Wellington waterfront, right next to Te Papa Tongarewa Museum of New Zealand. It can be hard starting out as an artist, something Regan learnt all too quickly. Two of his early projects expressed his frustration. His first, ArrRghT, was created using 350 light bulbs. Lit up, the word “ARRRGHT” became the underwater scream (ARRRGH) of a young artist. Simply by adding the letter “T”, the scream also suggested the word “art”. Regan’s second project was called A Foot in the Door. He visited over eighty art galleries, inserting one-foot rulers inside the gallery doors! It was, he says, a great way to find out about the New Zealand art scene – and of course to learn how to get his own foot in the door. Over the last few years, Regan has created all kinds of artworks inspired by everyday things. He’s made a giant deck chair as well as a living room in rubbish skip – complete with a TV, pot plant and coffee table. 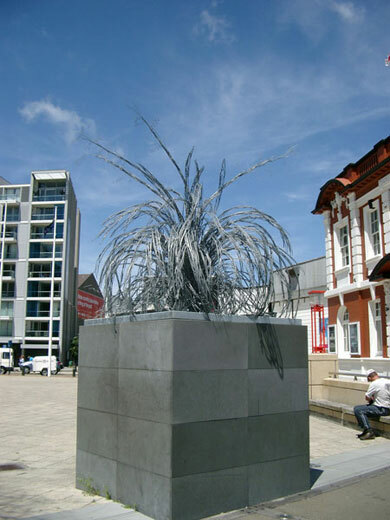 One challenging project in Invercargill, where Regan was the city’s resident artist, involved a mountain of gorse. Regan used the yellow gorse flowers to make cakes, wine, soap, and perfume. Wood from the branches and stems became a picket fence, a saw, a cradle, a comb, and charcoal, and he used the prickles to make tea, a broom, and toilet paper. “What started out as a simple, kind of crazy idea turned into something pretty amazing,” he says. “People really liked it.” The exhibition was called Of Gorse Of Course. One of the things Regan loves about being a sculptor is all the challenges. “Having an idea is only five percent of a project,” he says. “I spend a lot of time figuring out how each new piece will work and I come up with detailed plans before I start on it.” And there’s always a lot of problem solving along the way. Making the tools he needed to make Green Islands, including special pliers for clipping the wire together, took Regan six weeks. It took another ten weeks to complete the work. According to Regan, sculptors need to have a big bag of tricks. “Apart from talent and imagination, they need to be curious about the world around them. They also need to be patient, persistent, and confident – and it helps to be good at maths and physics.” Finally, a sculptor can’t be afraid of hard work – something Regan has definitely learnt.